8 Masters (3 w/King, 3 w/Queen, 1 w/2 Twins, 1 w/2 Bunk Sets). Sheets and Towels Provided, Beds Made. 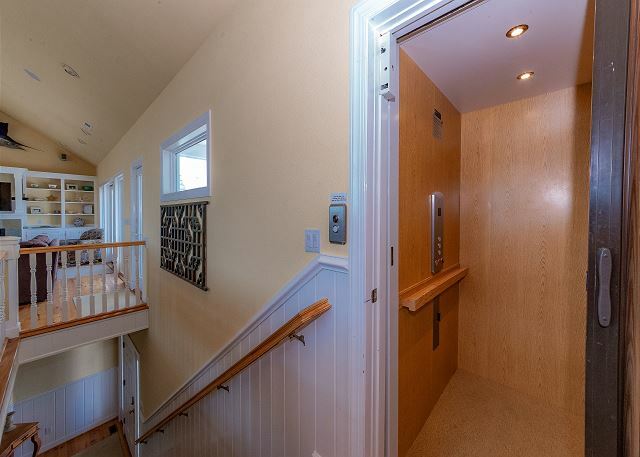 ‘Big Sea’ is a beautifully decorated 8 bedroom, 8.5 bath home located on a quiet cul-de-sac in Ocean Sands. 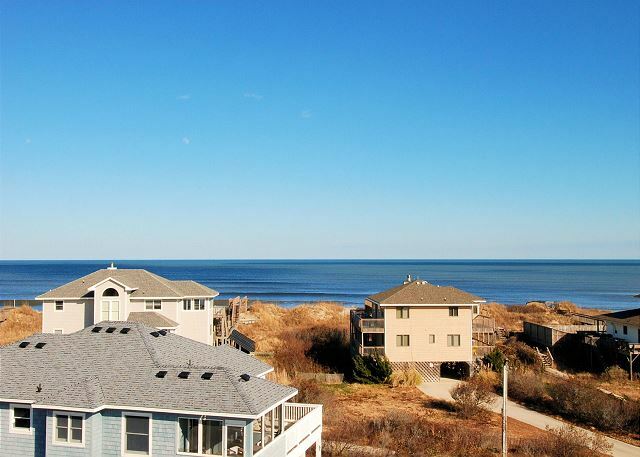 You’ll love the proximity to the beach…only 55 yards to the beach access! The home offers plenty of space for your large family including a huge great room with fantastic ocean views, eight bedrooms and tons of decks (be sure to check out the crow’s nest). Other features include an elevator to all levels, fully-equipped kitchen, two dishwashers, three refrigerators, two washers, two dryers and lots of outdoor space with private pool, hot tub and picnic area. Two Dogs are allowed. Big Sea offers kid-friendly amenities including a highchair and two Pack N Plays. Make your next vacation a summer to remember at ‘Big Sea’. Outside: Private 14x33 Pool, Hot Tub, Gas Grill, Horseshoes, Basketball Goal, Outdoor Shower. Lower Level: Elevator, Master Bedroom w/Queen w/TV, Master Bedroom w/2 Bunk Sets w/TV, Bedroom w/Queen w/TV and Semi-Private Bath, Rec Room w/ Pool Table, Foosball Table, TV, Kitchenette, Microwave and Sitting Area, Washer & Dryer and Garage with Ping Pong Table and Refrigerator. Mid-Level: Elevator, Master Bedroom w/King w/TV, Deck Access; Garden Tub and Large Tiled Shower, Master Bedroom w/King w/TV, Deck Access, Garden Tub and Large Tiled Shower, Master Bedroom w/Queen w/TV and Deck Access, Master Bedroom w/2 Twins w/TV and Deck Access, Washer & Dryer, Deck w/Hot Tub. Upper Level: Elevator, Great Room w/Large Flat Screen TV, Gas Fireplace, Access to Deck w/Crow’s Nest, Loft w/TV, Kitchen w/Breakfast Bar Seats 3, Dining Area Seats 10, TV Area, Master Bedroom w/King w/TV, Access to Private Deck, Garden Tub and Large Tiled Shower, Covered Porch, Powder Room. Repeat Renter discount available for off-season rentals.